Ferdinand Hodler (1853–1918), The Day (1900), colour on canvas, 160 × 340 cm, Kunstmuseum Bern, Bern, Switzerland. Wikimedia Commons. By 1895, Ferdinand Hodler (1853–1918) was turning to more Symbolist paintings and developing his mature ‘Parallelism’ from there. Ferdinand Hodler (1853–1918), Retreat from Marignano (composition study) (c 1897), pencil and gouache on fabric, 43 × 65 cm, Private collection. Wikimedia Commons. In 1897, Hodler won the commission to paint a large fresco in the Weapons Room of the Swiss National Museum (Schweizerisches Landesmuseum) in the centre of Zurich. 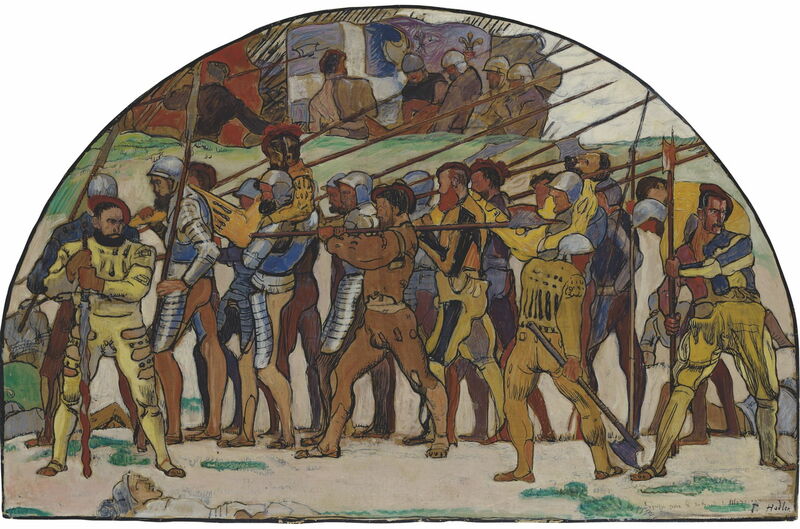 Oddly, Hodler proposed depicting the Battle of Marignano, fought between France and the Old Swiss Confederacy near Milan in 1515. The French had been the victors there, leaving the defeated Swiss with around 50% casualties. This compositional study for Retreat from Marignano was made in about 1897, using pencil and gouache on fabric. From its inception, the painting is composed as a frieze in two planes, with most of its figures in the nearer plane. Ferdinand Hodler (1853–1918), Retreat from Marignano (study) (c 1897), oil on canvas, 45 × 67 cm, location not known. Wikimedia Commons. 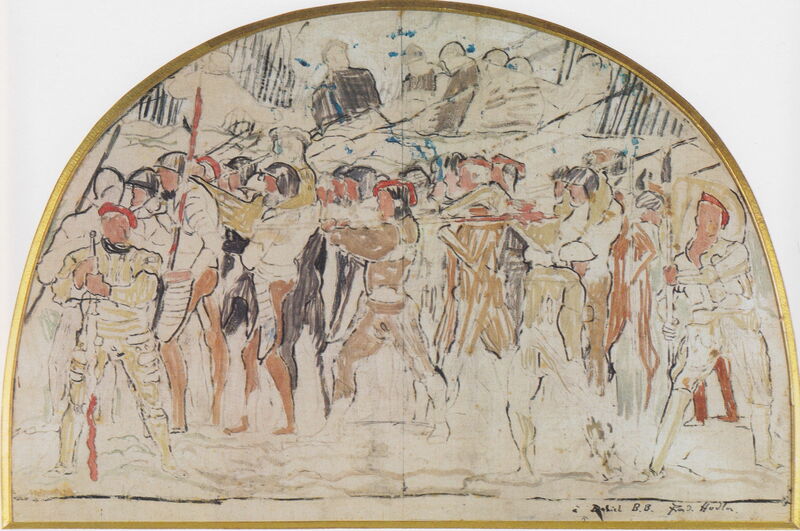 This more advanced study for the Retreat from Marignano followed soon afterwards, but Hodler’s theme, style and imagery were controversial, and the whole affair became the subject of intense public debate known at the time as the ‘fresco dispute’. In 1897, Hodler was invited by Gustav Klimt, president of the Vienna Secession, to exhibit in its first exhibition the following year, but declined, probably because of his commitments to commissions for the National Museum, which kept him occupied for much of 1898. Ferdinand Hodler (1853–1918), The Mower (c 1898), oil on canvas, 71.5 × 114 cm, Private collection. Wikimedia Commons. I am unsure whether Hodler painted his marvellous The Mower in about 1898, or if it was significantly earlier: the dates given are inconsistent. 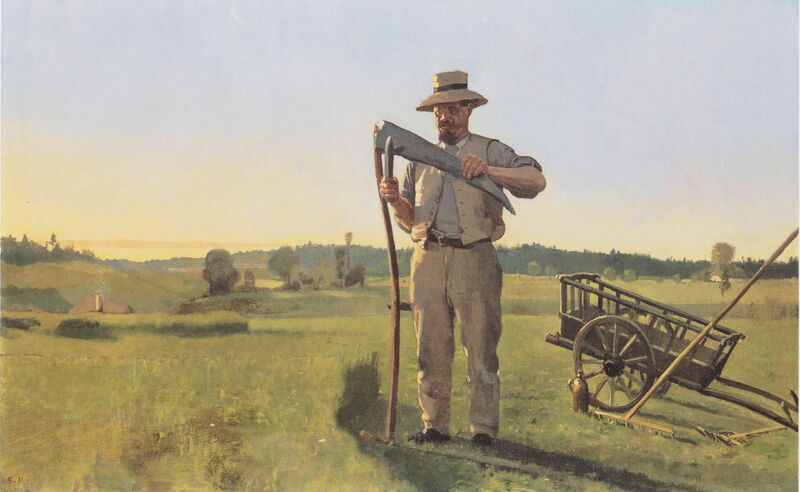 A farmworker is seen sharpening the blade on his heavy scythe using a whetstone, as the sun rises behind and to the left. 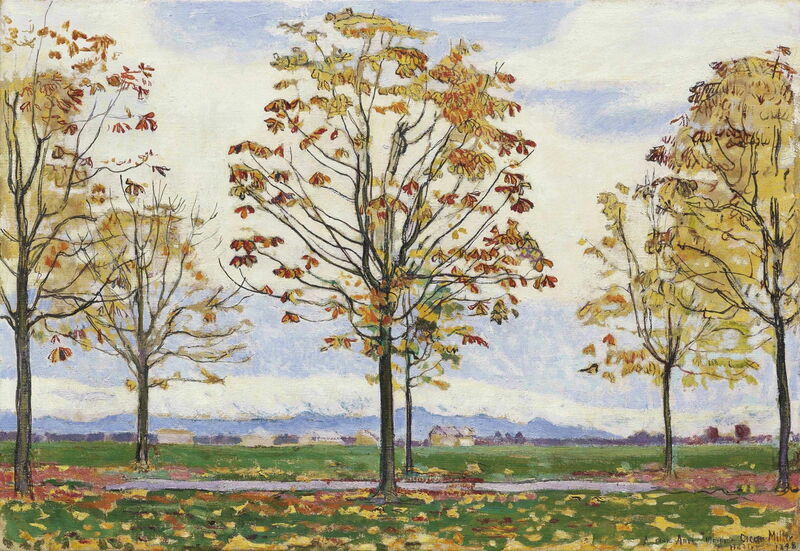 Ferdinand Hodler (1853–1918), Kastanienallee near Biberist (1898), oil on canvas, 38 × 55 cm, location not known. Wikimedia Commons. Hodler still found time to paint some of his superb landscapes when he was working his commissions. Among them is Kastanienallee near Biberist (1898), which shows leaffall in the autumn, in an avenue which runs parallel to the picture plane. Biberist is in northern Switzerland. 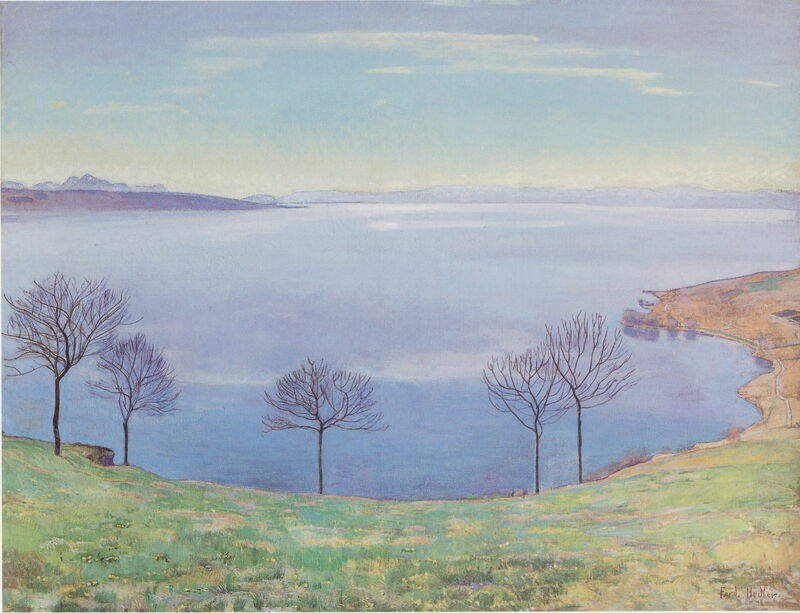 Ferdinand Hodler (1853–1918), Lake Geneva from Chexbres (c 1898), oil on canvas, 100.5 × 130 cm, Private collection. Wikimedia Commons. 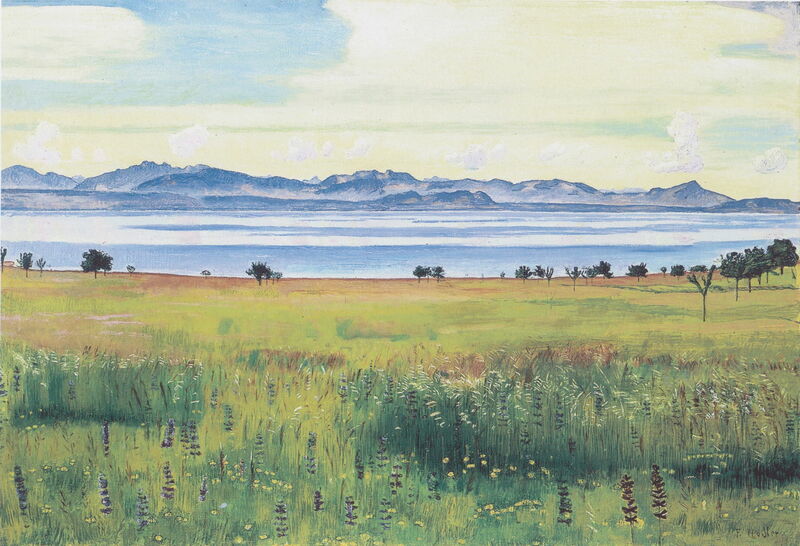 At about this time, Hodler started to paint a series of landscape views from the northern shore of Lake Geneva (Lake Léman) looking south, across to the major peaks of the Chablais Alps. He was to continue this series until his death about twenty years later. Lake Geneva from Chexbres from about 1898 shows one of the first of these, painted near the village of Chexbres in early winter. Hodler had started making sketches for The Day (1900) as far back as 1890. With its rhythmic figures and informal symmetry, it is one of the best examples of his Parallelism. He appears to have used three different models, with the woman in the centre looking much like his second wife, Berthe Jacques, whom he married in 1898. 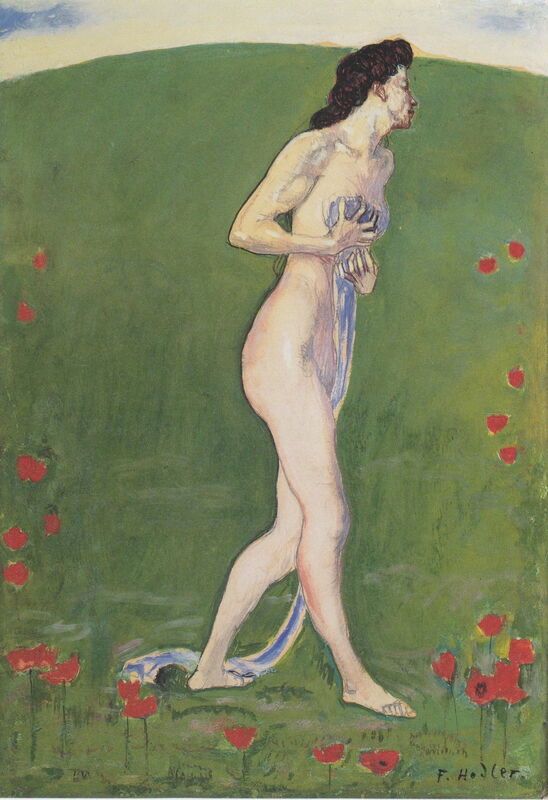 This was one of Hodler’s three award-winning paintings exhibited at the Exposition Universelle in Paris in 1900. He was invited to join both the Berlin and Vienna Secessions. 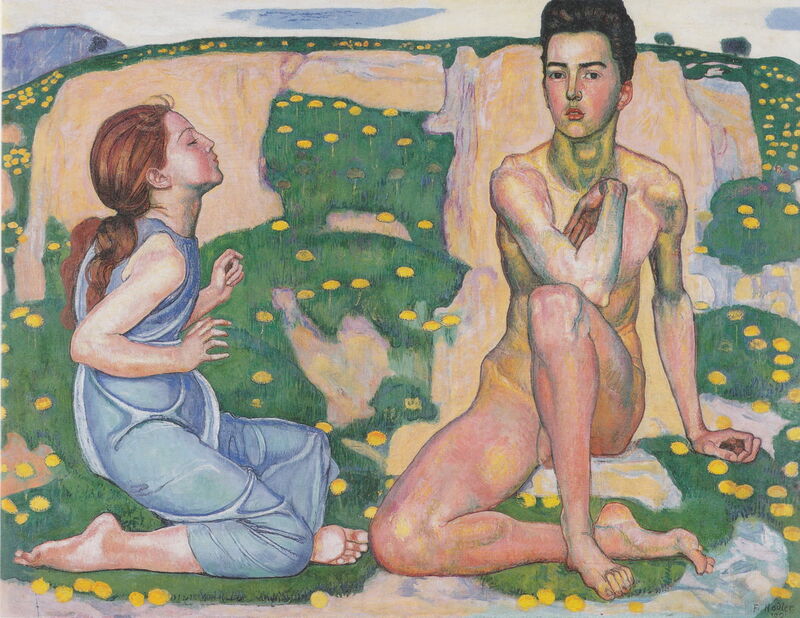 Ferdinand Hodler (1853–1918), Spring (1901), oil on canvas, 102.5 × 129.5 cm, Museum Folkwang, Essen, Germany. Wikimedia Commons. Hodler’s Parallelism also found expression in single figures and smaller groups, which he often painted in multiple versions over several years. In his Spring (1901), he sets two figures in their biological Spring in one of his idealised meadow landscapes, rich with the flowers of the season. Ferdinand Hodler (1853–1918), Lake Geneva from St Prex (1901), oil on canvas, 72 x 107 cm, Private collection. Wikimedia Commons. Lake Geneva from Saint-Prex (1901) is another view across the lake, from a town further west of Chexbres, looking south with a closer view of the peaks of the Chablais Alps. This appears to have been painted in the summer, with the trees in full leaf and a rich range of flowers. The clouds over the mountains are starting to become more organised in a regular rhythm, a trend which resulted in some of his most distinctive later landscapes. Ferdinand Hodler (1853–1918), Empfindung (Sensation) (c 1901), tempera on paper mounted on canvas, 39 × 27 cm, Von-der-Heydt-Museum, Wuppertal, Germany. Wikimedia Commons. Hodler’s tempera painting of Empfindung, best translated perhaps as Sensation, from about 1901, is one of his series of singleton women seen walking through floral meadows. Ferdinand Hodler (1853–1918), The Jungfrau from Isenfluh (1902), oil on canvas, 75 x 56 cm, Kunstmuseum, Basel, Switzerland. Wikimedia Commons. 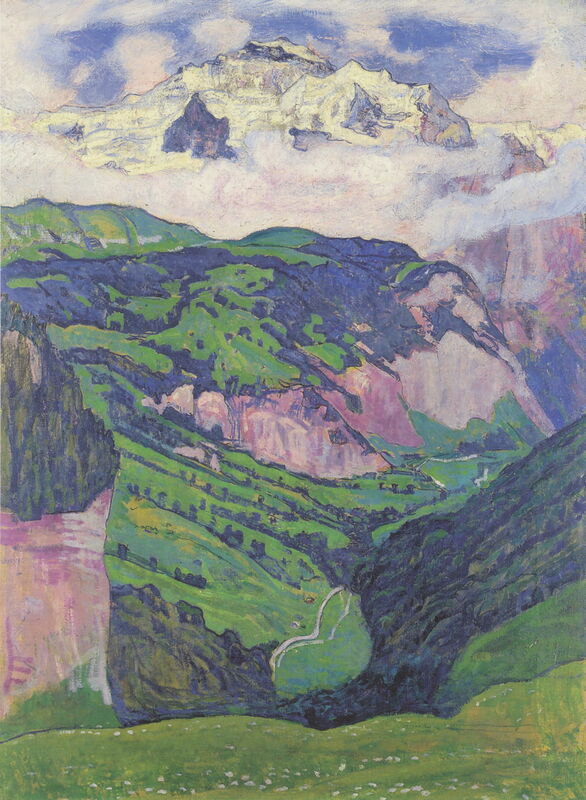 In July of 1902, Hodler stayed in Reichenbach im Kandertal in southern Switzerland, from where he went out to the hamlet of Isenfluh to paint The Jungfrau from Isenfluh, one of his most spectacular paintings of valleys and mountains. The distant peak of the Jungfrau (4,158 m or 13,642 ft) is one of the main summits of the Bernese Alps, to the east of the Chablais Alps shown in his views over Lake Geneva. Here the rock and ice of the Jungfrau floats in a world of its own above a belt of cloud and the deep, richly vegetated valleys below. This painting was exhibited at the nineteenth exhibition of the Vienna Secession. Ferdinand Hodler (1853–1918), Kiental and Blümlisalp (1902), oil on canvas, 84.5 x 85 cm, Kunstmuseum, St Gallen, Switzerland. Wikimedia Commons. 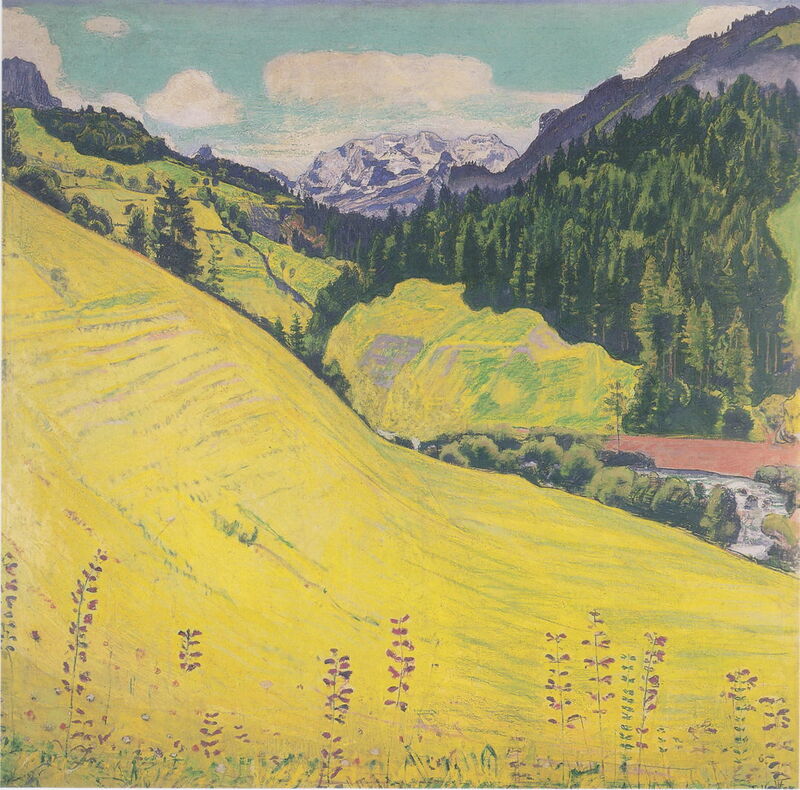 Another landscape painted when he was staying in Reichenbach, Kiental and Blümlisalp (1902) shows a colourful valley leading to the Blüemlisalp massif in the Bernese Alps, seen in the distance. Its main peak, Blüemlisalphorn, is not as well-known as the Jungfrau, and is rather lower, at 3,661 m or 12,011 ft.
Ferdinand Hodler (1853–1918), Forest with Mountain Stream (1902), oil on canvas, 100 × 72 cm, Kunstmuseum Solothurn, Solothurn, Switzerland. Wikimedia Commons. 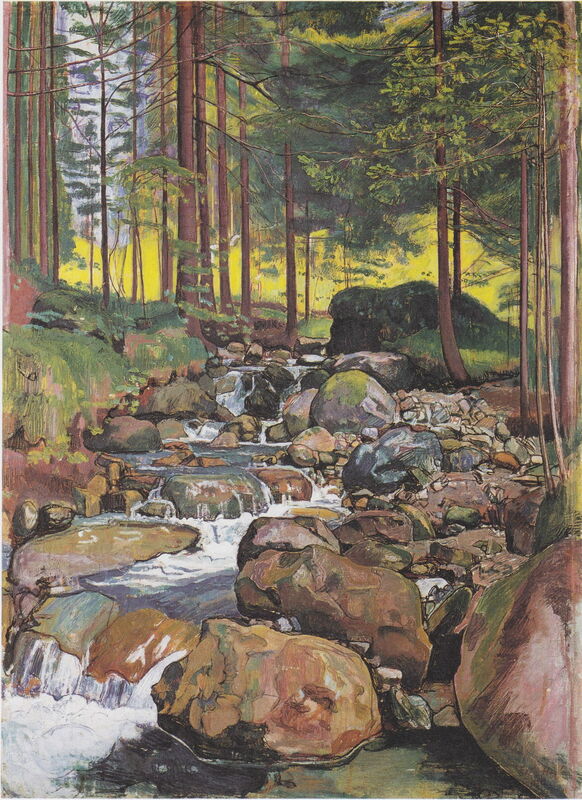 The final landscape of Hodler’s which I have for 1902 could also have been painted when he was at Reichenbach: Forest with Mountain Stream, which could equally have been painted at many other locations in Switzerland. It is thought that most of Hodler’s landscapes were either started in front of the motif and completed in the studio, or painted entirely indoors from studies and drawings accompanied by extensive colour notes. He appears to have completed few, if any, entirely en plein air. Hans-Peter Wipplinger (ed) (2017) Ferdinand Hodler, Elective Affinities from Klimt to Schiele, Leopold Museum / Walther König. ISBN 978 3 96098 220 3. Posted in General, Life, Painting and tagged Hodler, Klimt, landscape, painting, parallelism, realism, Secession, series, symbolism. Bookmark the permalink. Holder was a great influence on the Viennese painter Richard Gerstl. He also reminds me a little of the Cornish Symbolist Thomas Cooper Hitch.